On Thursday (4th of August 2016), the Board of Deputies organised a visit of the new Communities Minister Lord Bourne to the Hampstead Synagogue in West Hampstead. The visit was part of a day of engagements for the Minister with faith communities across London. 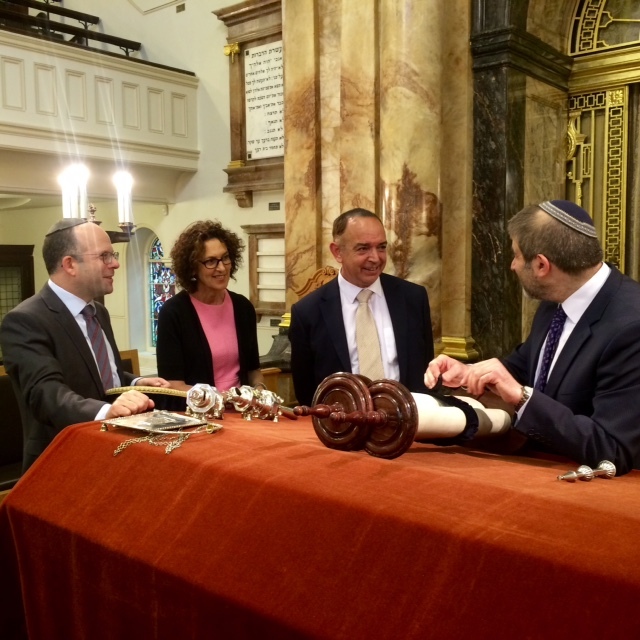 During the visit, the Minister was shown the features of the synagogue by Rabbi Dr Michael Harris and Co-Chairs Adrienne Rosen Powell and Michael Helgott. The minister was also briefed on issues facing the Jewish community by the Board of Deputies’ Gillian Merron, the Jewish Leadership Council’s Adam Langleben and the Community Security Trust’s Jonny Newton. “We are greatly enriched by the diversity of faiths that call our Country home. “Within an hour you can visit places of worship representing our largest religions, through to our smaller faiths, all of whom play an integral part in communities. Read Lord Bourne’s own words about his day in the Jewish News.